Two detectives on hot trail of the suspect: Detective Sato, a seasoned detective who knows what it takes to solve a crime. Detective Murakami, a rookie driven by a sense of guilt because his Colt Automatic was stolen and used in the attempted armed robbery. They walk around all over the city immersed in heatwave, meeting shady characters, asking lots of questions. At the end of the day, Sato takes the rookie to his home in a quiet suburb. No urban vulgarities trespasses the sanctuary of family here. Over glasses of beer, they talk about the crime and the criminal. Sato says he never comprehends the psychologies of ‘‘Après-guerre”, postwar young generation. Sato : Yeah, but to me, (the criminal is) thoroughly disgusting (akire-kaeru). When Sato says ‘akire-kaeru’, a pun on “après-guerre”, he throws his hands in the air, indicating the frogs (kaeru) croaking out in the field. Apparently, lost in translation was this silly word play by an drunk old man. The English subtitles I have seen do not include the reference to frogs croaking. That’s fine since it does little to advance the plot or to contribute to narratives of the film. But I would like to point out that this is one of few instances in this film that the character makes reference to the sound/noise in background. 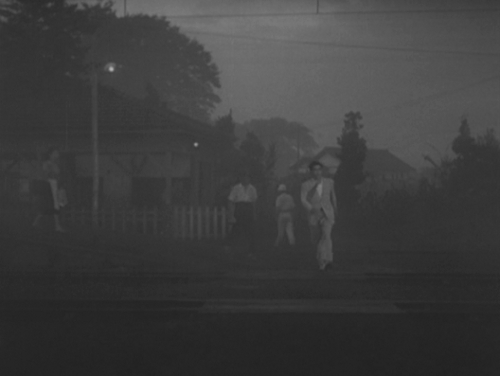 “The Stray Dog”, the pinnacle among the early Kurosawa’s works, is filled with music, sound and noise. Its innovative use of soundtrack in many pivotal scenes has been appreciated in numerous reviews and analysis. Especially, the final shootout between Detective Murakami and the killer, a piano etude being played in background, provides the best example of “counterpoint effect” between visual and audio. The city is filled with music, noise and sound. The montage sequence depicts Detective Murakami going undercover to find the underground gun dealer. His wandering in this rotten world is packed with barrage of all the kitsch music imaginable. According to Shinichi Kamoshita, these songs were actually so popular at the time that anyone from that era knows them by heart. Radio music programs were immensely popular among entertainment-hungry public, covering a vast range of music repertoire, from jazz to classical to Japanese folk songs. Radios were in boom. In many markets and shops, they had their radio on with their volumes turned up. The place must have been filled with bombardment of all music available. The soundtrack to the montage sequence is meant to recreate this chaos of sound. Though these music fills the air, they are not actually ‘listened to’. Few people is paying attention to them. No one makes any reference to them. Urban streets were packed with people who were indifferent to each other and they still need flood of sounds to make sure impersonal voids were filled. The role of music in urban environment was changing. Kurosawa and Hayasaka were acutely aware of that change. 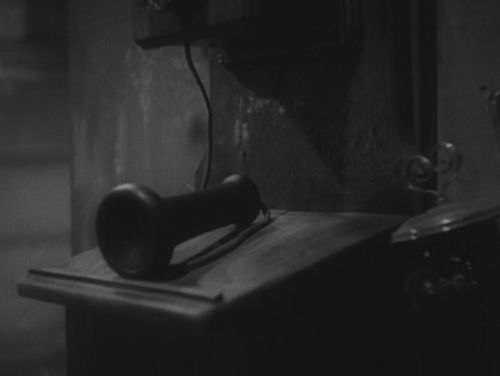 Kurosawa had been exploring the urban noises in the earlier works. In one of the scenes in “One Wonderful Sunday“, we “see” and hear the blasting sound of music coming out of the speaker out in the street. Here he shows the actual speaker itself so that we can identify the source of the annoying noise. In “Drunken Angel“, we hear absurdly cheerful “The Cuckoo Waltz” in the black market. In both cases, the character in the scene is not supported by the music; miserable Yuzo and Matsunaga, respectively, become painfully pathetic. Because no one pays attention to music, music doesn’t pay attention to anyone. This relationship reciprocates even when the deadly violence takes place. Cracking sound of ‘La Paloma’ through the phone receiver is an impersonal, indifferent witness to shootout in the hotel, which seriously injured Detective Sato. There is another kind of sound in the city. You could hear frail beings trying to survive. The dance hall, that’s where human release the energy into the thick air of city, is the arena of lust, desire, money and survival. The film captures the explosive energy of the time. We hear girls panting with exhaustion, young flesh and blood breathing heavily. In the background, the saxophone player doodles with notes. This is the noise they make. We hear the noises of life. If urban development is symbol of chaos, suburb landscape is still that of tranquility. Sato’s house, though he himself calls it a shack, is something akin to places of peaceful living for Japanese for many centuries. His place reminds me of “Staying cool under the arbour of ‘evening glory‘”, the painting by Morikage Kusumi, the 17th century master. The work portrays the tranquil happiness of family in summer dusk. The husband/father must be tired from a day’s work but satisfied with his simple life. The wife/mother also toiled for all day and was relieved from all the chores just before the nightfall. Their child is with them, probably asking questions about the world around them. The unity of family is tied to openness, listening to ambient noises of insects, small animals and birds. If you look at how this family is looking out into the space, you know they are listening to the world around them. When they felt breezy air, they realized they were not living by themselves, but they were part of the world around them, small elements in the universe, coexisting with infinite numbers of living forms. Sato’s reference to frogs croaking is reminiscent of this coexistence. This sense of coexistence is lost to the urban dwelling, symbolized by Yusa’s pathetic shack. The path the postwar reincarnation took was upgrading Yusa’s shacks to something livable with concrete walls and elevators, You have a glimpse of intermediate upgrade in Kurosawa’s “High and Low” 14 years later, where Takeuchi, a medical-school-student-turned-a-sadistic-killer, lives with tormented desire.Kurosawa carefully used suburban landscape to stage the last of the mad dog. Shootout between après-guerre doppelgangers is placed in this Utopia, evoking the tranquil atmosphere of Sato’s house. When we hear the piano etude played in the background, do we expect Yusa also hears it? Does Yusa notice it at all? Does that affect his violent urge? When the two collapse on the ground, we hear the children’s chorus. Does Yusa, or Murakami, hears it? Do they notice irony of lost innocence? We think they do, but it’s us watching these two in the context of music. It’s us who feel “irony”, “contrast” or “counterpoint”. Absence of dialogue, or of any explanatory narratives forces us to project our own sensation onto the screen. Furthermore, does the piano player ever care about the desperate après-guerres? Does the children ever stop singing? This indifferent, cruel nature of sound/music is not exclusive to the city anymore: Postwar era welcomes urbanization of the suburb. After more than half a century later, they were the landscapes lost forever. The small local railway station, where Murakami identifies Yusa, was Ohizumi-Gakuen station near the Toho studio. As you can see, the area around the station was still much left untouched in the film. Today, it is one of those nondescript Tokyo area railway stations, filled with concrete structures, mega-chain stores and taxicab stations. Frogs are no longer croaking, the pianos are played behind closed doors, no kids is singing out in the field. This transformation had taken place drastically after the war. 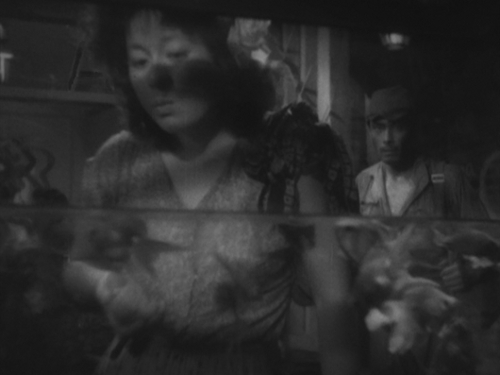 In the same year as “The Stray Dog”, Ozu directed “Late Spring”, the complete moratorium on postwar process. He directed “Tokyo Story” a few years later, carefully making Tokyo absent, as I have noted (1,2,3,4). 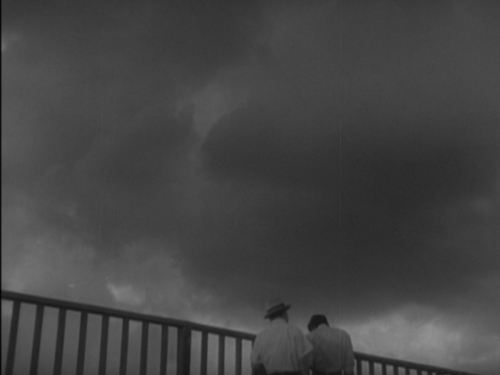 Ozu couldn’t stand the chaotic nature of the world outside his hemisphere. Kurosawa, on the other hand, paints a bold picture on them, trying to swallow it. Is this the world après-guerre dogs created? Maybe. One thing is for sure. We don’t listen to noises around us anymore.